Global Industrial Boiler Market size will surpass USD 12 Billion by 2024, as reported in the latest study by Global Market Insights, Inc. Rapid industrialization across emerging economies coupled with substantial investments toward the expansion and modernization of existing industrial facilities will stimulate global industrial boiler market size. For instance, in 2018, Lord Corporation announced to invest USD 80 million to expand and upgrade its manufacturing facility in the U.S. by 2023. Furthermore, shifting trends toward energy efficient heating systems on account of rising concerns over greenhouse gas emissions will stimulate product adoption. Global industrial boiler market is set to witness robust growth on account of positive outlook toward pulp & paper and primary metal manufacturing industries. In addition, ongoing investment across industrial sector coupled with rising focus toward substitution of conventional heating systems will further drive the product deployment. Condensing industrial boiler market is anticipated to witness gains over 4% by 2024. High efficiency, low environmental impact and reduced heating costs are some of the prominent features which make the product deployment preferable over other available alternatives. Rising investment toward substitution of conventional heating units coupled with regulatory policies to reduce carbon emissions will further thrust the product adoption. 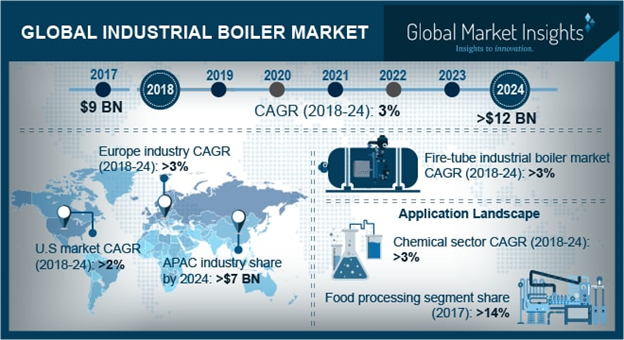 175-250 MMBtu/hr boiler market is predicted to grow over 5% by 2024. Ongoing industrial investments toward expansion of refinery & petrochemical industries along with increasing applications of these steam generating units across industries will positively influence the business landscape. For instance, in 2018, Saudi Aramco & Total signed a memorandum of understanding for the construction of a petrochemical complex worth over USD 5 billion in Saudi Arabia. Gas fired boiler market is anticipated to witness growth on account of robust gas infrastructure. Natural gas is considered to be one of the cleaner fuels consumed by industrial sector to meet growing energy needs. Rising investment toward the extension of existing gas supply networks favored by declining fuel prices will further augment the industry growth. Europe industrial boiler market is predicted to grow over 3% by 2024. Stringent emission norms across the region coupled with implementation of regulatory measures pertaining to industrial pollution will drive the demand for replacement of conventional boilers. In line with the global initiative to reduce carbon footprint, the European Union in 2015, introduced the Eco-design Directive with respect to solid fuel boilers with an aim to minimize the negative environmental impact of GHG emission. China industrial boiler market in 2017, was valued over USD 2 billion. Indigenous innovation for industrial development coupled with respective government focus toward the advancement of manufacturing facilities will stimulate the industry landscape. Over the years, the country has witnessed considerable shift of industrial facilities from developed economies. As per the World bank, manufacturing value added in 2017 was USD 3.591 trillion as compared to USD 2.935 trillion in 2013, representing a change of 22.3%. Key industry players operating across global industrial boiler market include Bosch Thermotechnology, Cleaver-Brooks, IHI, Clayton, Fulton, Thermax, General Electric, Bharat Heavy Electricals, Siemens, Cochran, Forbes Marshall, Rentech, Mitsubishi Hitachi Power Systems, AMEC Foster Wheeler, Hurst Boiler, Doosan, Babcock and Wilcox amongst others.